PITTSFIELD, a city of 43,000 on the Housatonic River in western Massachusetts, is a quintessentially American place, but in many ways an unlikely spot for a housing boom. The 255-year-old former industrial hub boasts the country’s earliest written reference to baseball. Its economy was dominated by General Electric for much of the 20th century. But by 2000 it had experienced ten years in which hardly any new jobs had been created. Incomes were 12% below the national average. The city’s population had been shrinking for decades. And yet between 2000 and 2007, amid a nationwide, credit-fuelled property boom, house prices in Pittsfield jumped by 70%, or 8% per year. These days, such rapid growth in economically struggling cities is rare. Whereas local housing markets rose and fell together during the housing bubble and bust, the housing recovery which began in America in 2012 has been patchy. Cities and towns with growing economies have seen big gains; places like Pittsfield have stagnated (see chart 1). Such trends are contributing to a widening of America’s already unequal distribution of wealth. According to an annual survey of consumer expenditure from the Bureau of Labour Statistics (BLS), homeowners without a college degree have seen the value of their homes appreciate by less than 0.2% since 2012, whereas college graduates have enjoyed gains of 10.8%. 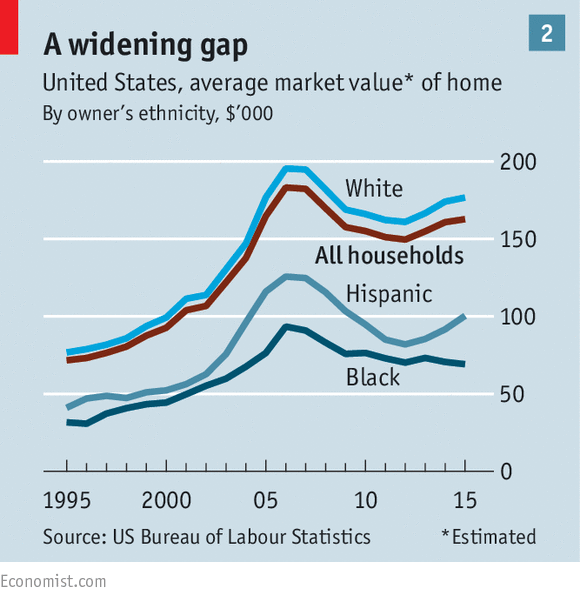 Similar discrepancies are evident for black and white homeowners, whose properties have fallen in value by 1.5% and risen by 9.8% respectively (see chart 2). That local economic conditions should play an important role in housing markets seems obvious. The price of a home, like that of any other asset, is driven by supply and demand. Cities with rising wages and growing workforces will have higher housing demand. In recent decades, high-skilled workers have increasingly sorted themselves geographically, preferring to live in high-wage cities with desirable local amenities. This has led to the growth of places that some economists have dubbed “superstar cities”. Data from the BLS and Freddie Mac, a government-supported mortgage agency, suggest that the relationship between economic fundamentals and house prices across metropolitan areas is stronger today than in past cycles. During the two decades leading up to the housing crisis, employment and income growth could account for about 33% of the variation in house-price appreciation across the country’s 380-odd “metro” areas. Since 2012, when the American housing market’s recovery began, this figure has jumped to 48%. Before the crash, a percentage-point increase in employment growth was associated with a rise of 0.6-0.7 points in house-price growth. In the past four years, such a rise in employment growth has come with a two-point increase in house-price growth. A paper published in 2010 by Stijn Van Nieuwerburgh, of New York University, and Pierre-Olivier Weill, of the University of California, Los Angeles, found that the association between incomes and house prices had strengthened. Between 1975 and 2007 house prices became ten times more sensitive to wages. As productivity and wage gaps across metro areas widened, house prices also diverged. This trend has continued. Changes in lending practices have also contributed to the divergences. During the housing boom, prices rose in virtually every metropolitan area, regardless of employment or income growth. Joseph Gyourko, of the University of Pennsylvania, says that these economic fundamentals were largely ignored at the time because credit was so widely available. Since then, banks have tightened lending standards and shifted credit to better-off borrowers. According to data from the Federal Reserve Bank of New York, the credit score of a typical mortgage-borrower is now roughly 50 points above its pre-crash low (from about 700 to about 750). This has allowed the most creditworthy to bid up prices further in cities like San Francisco, while prices in places like Charleston, West Virginia, have sagged. Housing experts agree that a stronger link between local house prices and underlying economic fundamentals is a positive development. And yet diverging housing-market trends across high- and low-wage cities will inevitably contribute to growing wealth and racial inequality. “Superstar cities” will lose their lustre if they are affordable only to the richest.